Unicorn Cupcakes are astonishingly pretty, delicious and also easy to make. Perfect for themed parties, these are meant to be a hit with everyone. These Unicorn Cupcakes are so pretty and tasty, that is perfect for themed parties, and is a hit with kids and adults alike! I am obsessed with color purple, and I love making Galaxy Cupcakes, Magic Purple Cake and Purple Muffins. 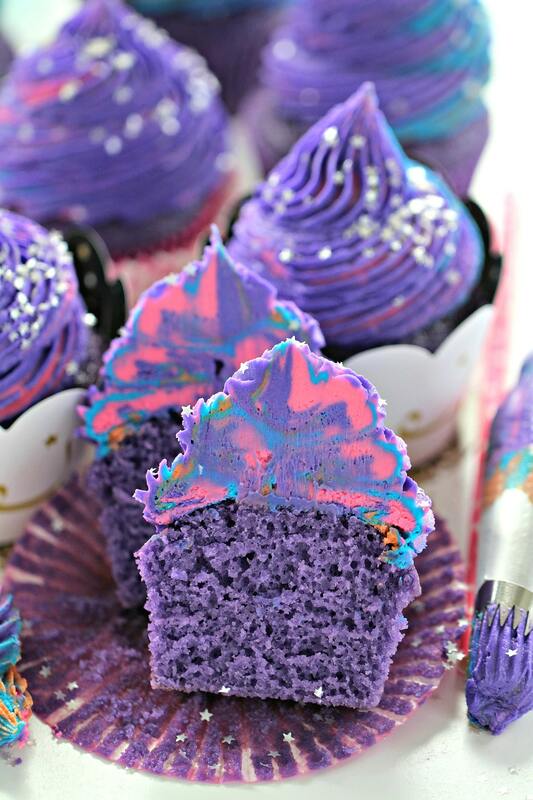 Unicorn Cupcakes are so pretty and tasty! My love for purple color goes way back, and that’s why I am always excited when I get the chance to make purple desserts. I made these Unicorn Cupcakes for my son’s birthday party last year and somehow I forgot to post them. I was browsing through my photos yesterday and was pleasantly surprised when I found these. The cupcakes were a huge hit with kids and adults. What’s not to love about them? They are soft and moist and topped with a sweet vanilla buttercream. The best part of this recipe is that it’s easy to follow and you can make the cupcakes in any color you would like! 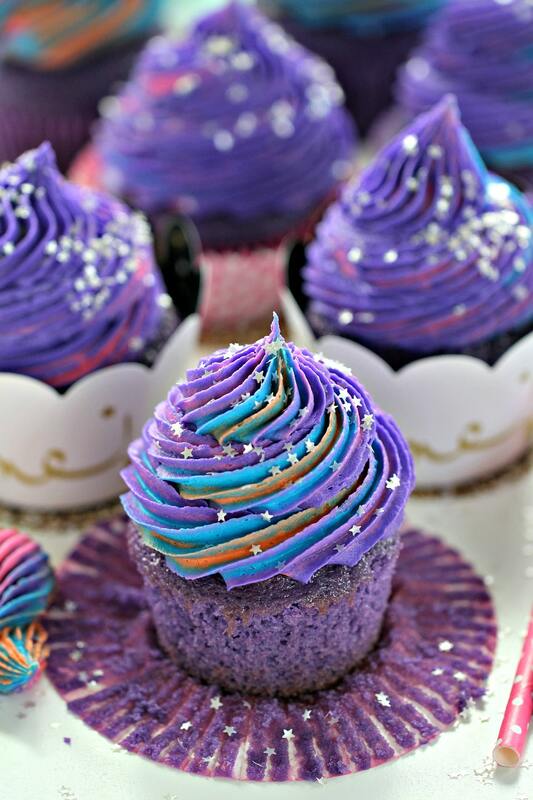 I used my go-to recipe for the cupcake batter for the Unicorn Cupcakes recipe, you can use any recipe that you like. I like this one, as the cupcakes are moist and soft. You can also use a store bought cupcake mix to save time. 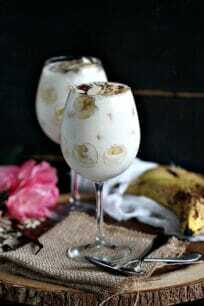 You can add different flavors to the batter, almond extract, vanilla extract or cherry extract are delicious options. 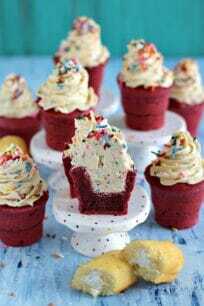 For the best cupcakes and for them to rise nicely in the oven, do NOT over-mix the batter. Make sure the oven is preheated and the ingredients are at room temperature. After you put the cupcakes in the oven, do NOT open the oven door for 15 minutes. When making the buttercream, it has a lot of sugar so it can hold its shape when piped. I do not like the taste of shortening, thats why I only use butter in my frosting. If you want to use shortening, to create a stiffer buttercream, replace half of the butter with shortening. Sugar amount stays the same in both cases. Be extra careful when working with food gel coloring. It can easily stain your hands, counter or carpet. Cover the surfaces accordingly. When piling the colors on top of each other on plastic wrap, try to use the same amount of each color. Also, don’t add too much buttercream, eye it so it can fit in the piping bag. Can you refrigerate the Unicorn Cupcakes? Best to refrigerate the cupcakes for one hour before serving for the frosting to harden a bit. Keep the cupcakes refrigerated, because the frosting will melt at room temperature. Violet Gel Food Color – This is such a gorgeous shade of purple and you can add more or less to desserts to create different shades. Rose Pink Gel Food Color – this color is so bright and beautiful, I like having the larger container, it will last you forever. Americolor Soft Gel Food Color – a set of 12 in gorgeous shades, a must have if you love colorful desserts! Gold Star Cupcake Wrappers – these are so pretty, would be an amazing addition to your cupcakes. Twinkle Twinkle Little Star Confetti Table Set – perfect table set for a Galaxy or Unicorn themed party. 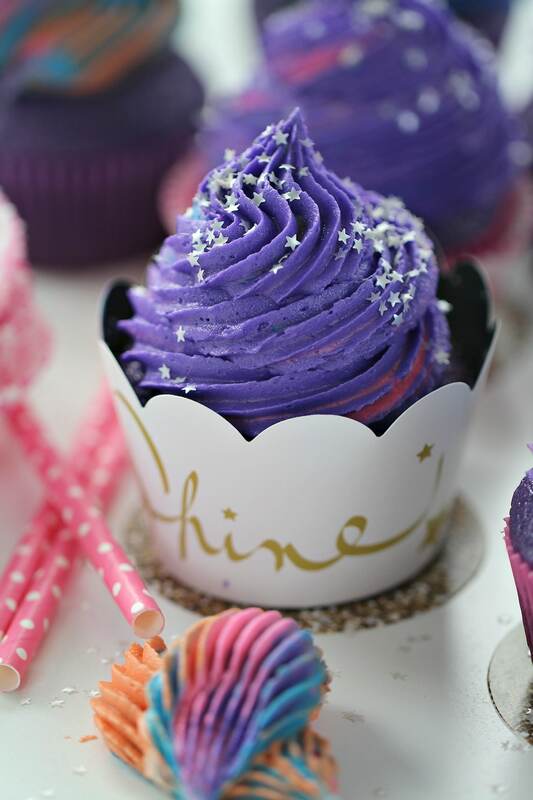 Silver Stars Edible Glitter – add the sky to your cupcakes with edible glitter! Add cupcake liners to a cupcake/muffin pan. Set aside. To a large bowl add dry ingredients: flour, sugar, baking powder and salt, whisk to combine. Set aside. Add milk, vegetable oil, vanilla extract and eggs to a mixer bowl and whisk until fully combined, about 1 minute on medium speed. Add the dry ingredients to the wet ingredients and beat until well combined. Stop once to scrape the sides and bottom of the bowl with a spatula. Slowly, with the mixer on low speed, add the water and 10 drops of purple gel food color to the batter and mix just until combined. Scrape down the sides of the bowl as needed to make sure everything is well combined. If you want the color more intense, add more gel color, stir to combine, careful not to over-mix. The batter is thin, I find it easier to add it to a pancake dispenser, this makes filling the cupcake liners much easier and mess free. Fill the cupcake liners just a little over half. Bake for 15-20 minutes, or until a toothpick comes out with a few moist crumbs NOT raw batter. In my oven, the cupcakes were perfectly done at the 20 minute mark. Do NOT open the oven until 15 minutes have passed. Start checking on the cupcakes at the 15 minute mark. If you are baking mini cupcakes, they may be done in 9-12 minutes, start checking after 9 minutes. Remove the cupcakes from oven and allow to cool for 3-5 minutes in the pan, then remove to a cooling rack to finish cooling. Add butter to a large mixer bowl and mix until smooth. Add 4 cups of powdered sugar and mix until smooth. Add the vanilla extract and milk, mix until smooth. Add the remaining 4 cups of powdered sugar and mix until smooth. If the buttercream is too soft, add more sugar, 1/2 cup at a time. Divide buttercream equally into 4 medium bowls. Add a few drops of purple gel food color to one of the bowls, about 7-10 drops, and stir with a spatula to fully combine. Set aside. Add a few drops of blue gel food color to one of the bowls, about 7-10 drops, and stir with a spatula to fully combine. Set aside. Add a few drops of orange gel food color to one of the bowls, about 7-10 drops, and stir with a spatula to fully combine. Set aside. Add a few drops of pink gel food color to one of the bowls, about 7-10 drops, and stir with a spatula to fully combine. Set aside. Start by preparing your work area, gel food color can easily stain your working surface so cover it with parchment paper or plastic wrap. Fix a piping bag with a large star tip, or any other piping tip that you like. Set aside. Cut about 15 inches of plastic wrap and place it on the counter. In the middle of the plastic wrap add about 1/3 of the purple buttercream, spread it into a 6x6inches square. Top it with 1/3 of the blue buttercream, and carefully, spread it on top of the purple square. Top it with 1/3 of the orange buttercream, and carefully, spread it on top of the blue layer. Top it with 1/3 of the pink buttercream, and carefully, spread it on top of the orange layer. Before adding the buttercream to the plastic wrap take a look at the piping bag you will be using, some are smaller and some are larger, so make sure the buttercream wrap once rolled is not larger than the piping bag, as it won't fit. Roll the wrap, so it forms a tube, and place the wrapped buttercream inside the piping bag. Do a first, pipe and dump test, to get the buttercream closer to the tip. 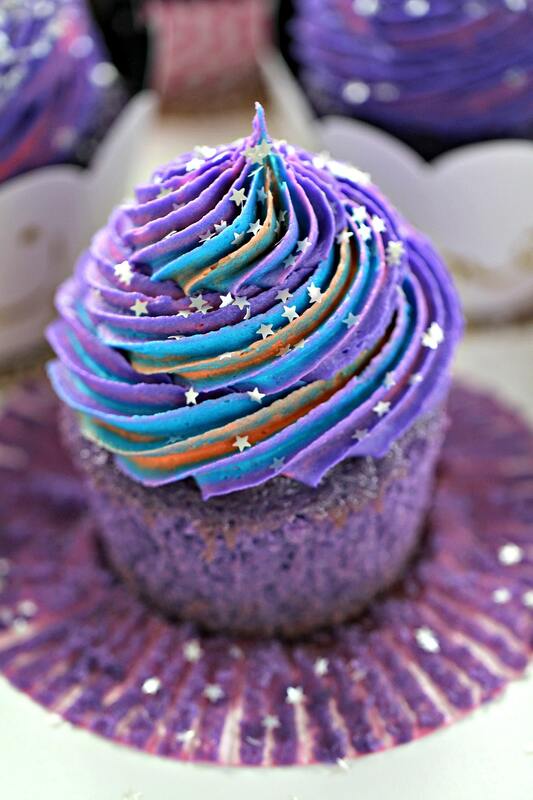 Pipe the buttercream onto the cupcakes and decorate with edible glitter stars or sprinkles. Repeat with the rest of the buttercream and cupcakes. Refrigerate cupcakes at least one hour before serving. OH WOW!! 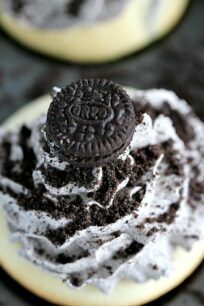 My kids would go wild for these cupcakes!! They are fantastic!! These are so perfect for any birthday or class party! OMG! I love these! My daughters would love these! I want a least a dozen of these soon! These have got to be the coolest looking cupcake ever!